The tools that make WPF development fast and easy. If you have rolled up your sleeves and started work on a WPF application, MindFusion WPF Pack offers more than one way to make your task much easier and less time-consuming. This set of native Wpf components gives your application every feature it might ever need to create, customize and present charts, diagrams, flowcharts, reports, calendars, gauges, user interfaces, Gantt charts and many more. MindFusion.Diagramming component is the best tool on the market to build a diagram in WPF - it features incredibly rich user interaction model with scrolling, zooming, panning, tool tips, undo and redo, multiple selection and clipboard operation to name just a few of the features that are supported. Add to this more than 10 automatic layout algorithms, an endless list of appearance options, output to browser, bitmap image or HTML, printing and you will easily understand why this tool is the preferred choice of some of the most prominent Fortune 100 companies as well smaller enterprises worldwide. You can present your events, appointments and reminders in 6 different views all of which support fully customizable, style-based appearance. The control supports in-place item editing, undo and redo, scrolling, multiple item selection and more. To customize the appearance you can use themes, item and cell templates, special effects. There are two auxiliary forms that facilitate the creation and editing of appointments and events - AppointmentForm and RecurrenceForm. This unique component has transformed building a spreadsheet in WPF into a smooth and easy task. Its impressive set of programming capabilities makes the features you need ready available - from endless customization options, to a rich event set and an impressive list of import and export formats. 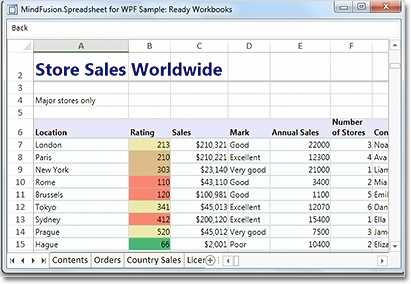 Make your spreadsheets look their best by placing charts and images. Save time and effort by utilizing the component's numerous auxiliary forms - they allow you to deliver superb results with minimum coding. Opt for the best possible appearance thanks to the flexible style system and the great choice of pens and brushes. This component really places no limits on the spreadsheets you can build. The charting component supports all popular chart formats - line, area, scatter, bar, column, stacked, pie, ring, doughnut charts as well various combinations among them. 3D area charts with wireframe and color map are also included. You can have unlimited number of data series and legends, use data binding, DateTime values or data arrays. The chart supports both second X and second Y axis, zoom and mouse drag. The rich customization options include various label types for the axes, dashed lines, the ability to change each font or brush that is used. A set of oval and linear gauges that let you show in your application a thermometer, compass, clock, equalizer and many more instruments. The gauges support styling and templates and can be embedded within each other. With the use of custom skins you can turn a linear control into an equalizer, resource monitor and more. You can use the logarithmic built-in functions to change the value distribution along the scale of a gauge. You can create whatever gauge you need - fast and easy. MindFusion.Gauges for Wpf are completely customizable and place no limits on the gauges you can build. The control supports all .NET data sources and is compatible with ADO.NET. 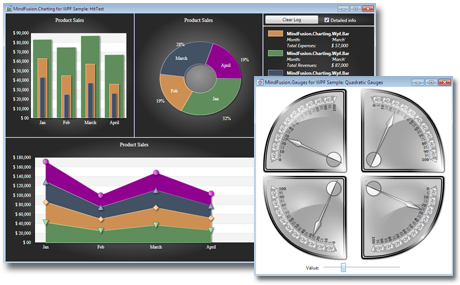 You can use multiple data sources in a report and add pictures, charts or any other WPF control. Reports can be printed, exported to all popular image formats, HTML and PDF. 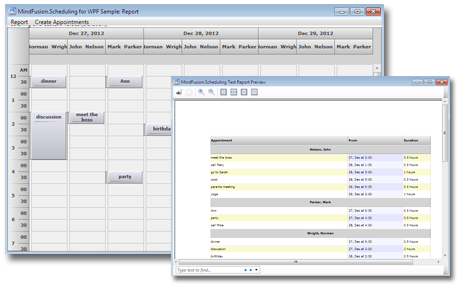 With MindFusion.Reporting you can zoom your reports or render them in a variety of sizes and layouts. The DataViews namespace includes three data visualization controls: the Gantt, Grid and Treeview controls, which combined together give you every single feature you might need to create a project management application. 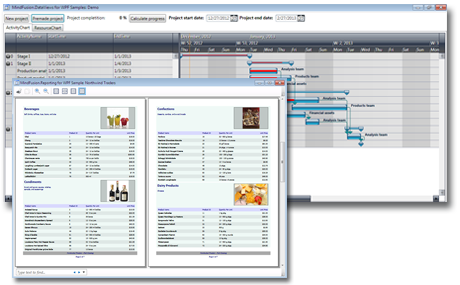 The DataView control lets you build a table, which shows the tasks, employees, time and other resources that are needed for the project. With the Gantt control you can present in an easy-to-understand way the whole project, its timeline and the allocation of the resources. 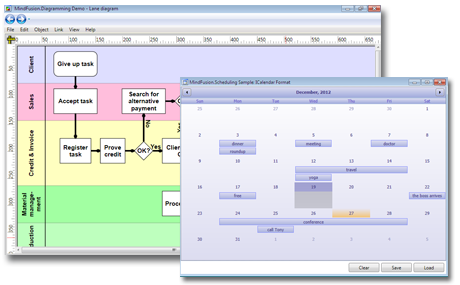 Both views use the TreeView control to show subtasks. Each task in the project can have dependencies. When working with MindFusion.DataView controls you are not restricted to using the predefined objects for activities, resources, dependencies and allocations - you can easily create your custom objects. 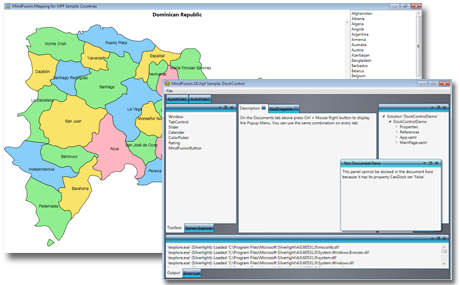 The component gives you a fast and easy way to build beautiful maps of any administrative or geographical area. It supports fully customizable appearance, scrolling and zooming, layers and more. A rich database with map files is also available. The user interface controls give you a fast and easy way to create eye-catching applications in Wpf. The controls are completely customizable, intuitive to use and can be quickly integrated into any Wpf application. Currently the UI controls included in the pack are accordion, button, tab control, dock control, numeric up and down, calendar, slider, ColorPicker and rating. There are ready-to-use samples available with all the controls. MindFusion is working to expand its list of WPF UI controls with some more great tools. Enrich your desktop applications with the accessibility of mobile apps with the virtual keyboard control. The control supports two layout modes - standard and extended, which gives you flexibility and lets you utilize the available space to the full extend. 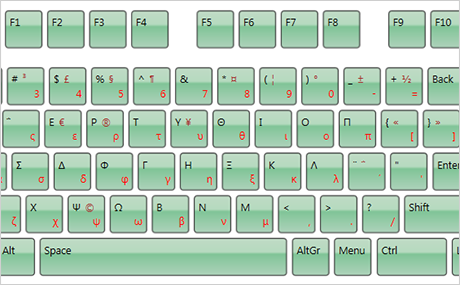 The long list of predefined keyboard languages is combined with automatic language detection - once the Windows input language changes the keyboard follows suite without any special command by you. The control exposes a rich API with numerous properties for appearance customization and sends multiple events, which let you detect any action performed by the user. MindFusion puts serving the customer at the core of its business. We employ dedicated support team that attends every detail into every support inquiry that we receive. We know how precious time is for each developer and we try to answer your emails, forum posts and help tickets within hours of receiving them, when possible - even faster. The licenses for MindFusion components aim to provide clients with more value for their money. We have big discounts for academic and other non-profit organizations, small businesses and freelancers and of course - returning customers. Though most of the components in the pack are sold separately, we strongly recommend that you choose the set - it is much more price worthy. Any license for any MindFusion component comes with 12 month upgrade subscription. Check the prices here.